Ability to filter down the number of tasks I see at a time. 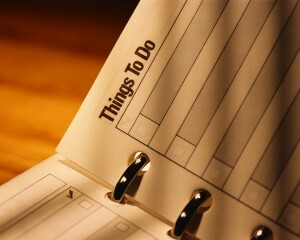 For example, show me just what I have to do today, or tomorrow or this week. Basically, I was looking for something that cut back information overload and would make my task list less overwhelming. I suppose, another implied requirement was that the tool would be free. My phone and tablet are both Android devices and in all the time I’ve had them I’ve barely spent any money on apps. I just haven’t had any need because the Android Market is full of good quality apps which are often completely free. I started with Wunderlist which was simple to use and available on Windows and Android, but I soon found it didn’t allow me to filter and manage the tasks effectively and it wasn’t much of an improvement over my paper notepad. The android apps were also quite buggy and took a while to refresh. Tried My Life Organized, a proper GTD based application and run with it for a while but felt there was too much going on and the screen always looked very busy. I didn’t really want to adopt the GTD system in full, just some elements that suited my way of working and this software seemed overkill for that. If I’m honest, I didn’t like the look and feel of the product either – very Windows 90-something and, shallow as that may sound, I find that if my tasklist is presented in a way that I find ‘attractive’, it helps with my motivation to actually work on the tasks. Bottom line: I wasn’t keen on paying for the full edition. I moved my tasks to Action Method Online which unlike MLO was aesthetically pleasing and very good at cutting back the ‘noise’ of incomplete tasks. However, I found that the functionality was more geared towards managing tasks that you shared with others and again, I didn’t see a point on paying for a system that only partially ticked my boxes. I read blog posts about using Evernote or Springpad to implement GTD. I had a go with Springpad but, I found that I was trying to force a square peg into a round hole and I wasn’t really using the tasklist to manage my work load. I wanted to make task management simpler, not more complicated so this defeated the object. I then moved to using Astrid – Chrome app, Android app, nice simple interface, but despite the positive feedback from other users I found it completely unreliable. Synchronisation didn’t work and tasks appeared and disappeared at will. No good. I loved it from the moment I installed it on my pad. I even forked out £16 for a year subscription to a pro account pretty much straight away. I have only been using RTM for about a month, but it’s made a huge difference already. Now I feel like I’m on top of my task list. I can easily add new jobs wherever I am, even if it’s just a quick note that I tidy up later. It tells me at a glance what I should be doing today. It’s not overwhelming, but it has plenty of functionality to tailor your list(s) to your personal needs. So, yep, it’s been a long quest, but ‘Remember the Milk’ has saved my bacon and got me organised at last. It just goes to show that you should never judge a book by its cover! Print article This entry was posted by Elena on 28/01/2012 at 9:00 PM, and is filed under Musings. Follow any responses to this post through RSS 2.0. You can leave a response or trackback from your own site.